News travel quickly in the world of EVE, and none quicker than those provided by the Scope. The Scope is a Gallente-based media firm that is widely regarded as the most far-reaching, depth delving public news agency there is. An eccentric but fabulously rich entrepreneur named Lous Chavol founded the Scope a century and a half ago. Chavol had made his fortune with one of the more successful communication companies that sprang up after FTL communications were discovered. Through his communication company Chavol had access to massive amount of information and it was a logical step for him to use this as a basis for a media company. 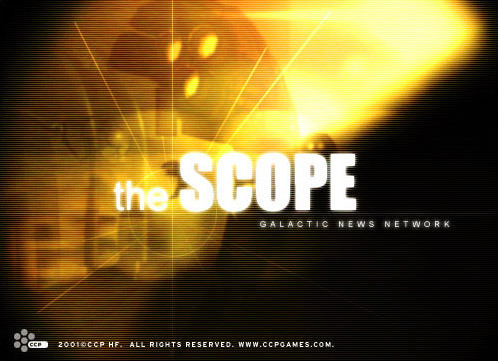 As most modern news agencies the Scope offers its service in many forms, such as through the traditional HoloVision, in order to cater to as many as possible. The most recent addition to this is to send news, even images, directly into the mind of the consumer through the use of headsets provided by Egonics Inc. This new service has already become very popular and the collaboration of the Scope and Egonics promises to be highly profitable for the two companies. The Scope has always set its standard for a fast and reliable news service. It has never descended into tabloid status, but always set its stock in being as truthful as possible, and this is the image it has managed to cultivate in the minds of people since its foundation. However, its critics point out that even if the news are true this tells only half the story. Just as important as a reliable news coverage is how the news are presented, how much time and space are allocated to each piece of news, how it’s presented and, most importantly, what news are omitted or played down. In this way, it is easy to influence and steer the public opinion because the perceived importance of events is more important than actual facts. As a prime example of this the critics of Scope mention the case of the Caldari pharmaceuticals giants Zainou, owned by the Ishukone Corporation, and one of the largest sponsors and advertisers of the Scope. Some years ago they got into trouble when accused of bad business ethics involving deals within the Minmatar Republic. The Scope gave these news very little coverage, but all the more to a piece of news of a new wonder-drug that Zainou was working on. Although there is no clear indication that Zainou itself interfered in this matter, many belief that the editors of the Scope decided by themselves to help their important supporters in this way.